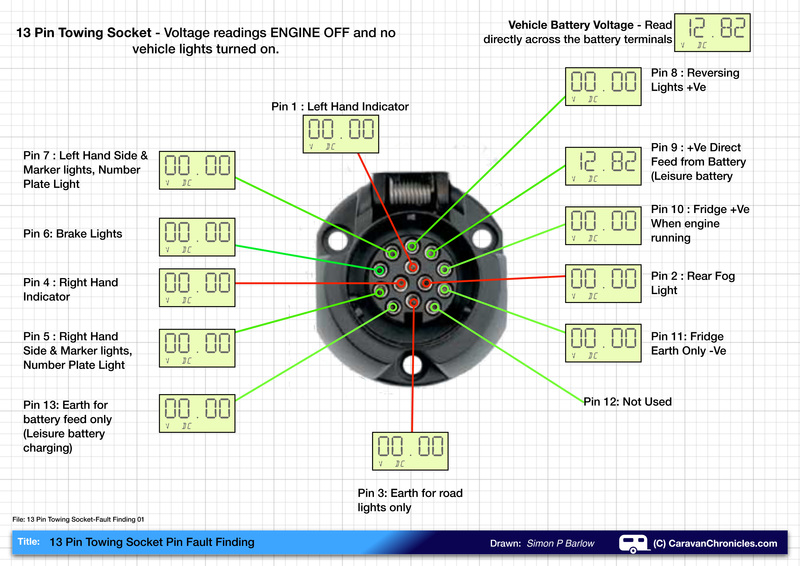 Heres a quick guide to basic fault finding on the towing vehicles 13 pin socket. I’ll assume you have a digital multimeter and are able to use it to take voltage readings. If you are unsure how to use your multimeter, have a quick read through the instructions supplied with your multimeter. As meters vary on the switch positions, you need to check that it is set for reading DC (Direct Current) VOLTS and can read voltages up to 20 volts. One of the first things is safety. As you are working close to the rear of the vehicle, make sure the hand brake is on. As the 13 Pin socket has a flap covering it, it is easier if you can find some way for holding the flap open. I use a length of string looped over the rear wiper arm and down to the socket flap. You could use a bungee cord in a similar manner. You need to find a suitable earth point on the vehicle to connect the negative (black) lead of your multimeter to. Sometimes the tow ball itself can be used, although this is not always reliable and it’s best if you can find an earthing point in the rear of the vehicle that wiring in the rear of the vehicle is connected to. The first test is carried out with the engine off and the multi-meter set to read “volts DC” to obtain a ‘reference’ voltage. 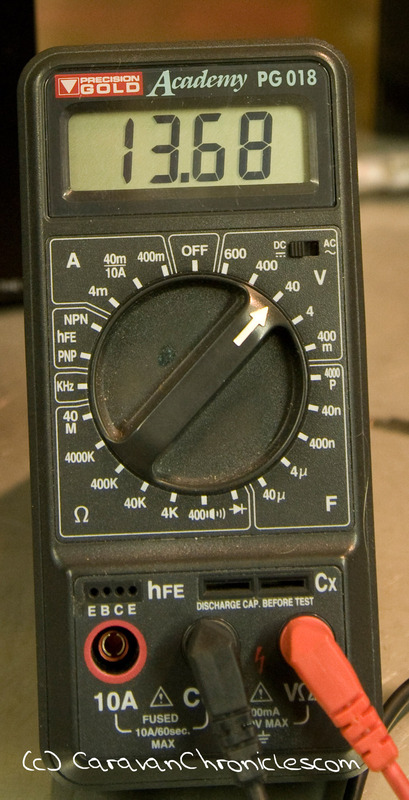 The ‘reference’ voltage is obtained by connecting the multi-meter directly across the battery terminals. In our example below, we have a reading of 12.82 volts. With the engine-turned off, and the negative test lead (black) of our multimeter connected to the earth point in the vehicle. We now check all the sockets connections individually using the positive (red) test lead. Only one – Pin 9 (leisure battery charging circuit) should have a voltage present on it….. If all that checks out OK we are ready to move on to the next test. SAFETY: We are now going to test the socket again, this time with the engine running. As you are working at the back of the vehicle you will be close to the engine exhaust. Don’t do this test in a garage. Always be aware of exhaust fumes. Don’t work at the rear of the vehicle with the engine running for more than a couple of minutes at a time. Again, check that the hand brake is applied. With the engine running we read the ‘reference’ voltage directly across the battery again. In our example now it is 13.75 volts with the engine running. Returning to the socket once again, connect the negative (black) test lead up to the earth point on the vehicle and go through each pin again. This time Pin 9 should show a voltage as well as should Pin 10 (Fridge circuit) We have now checked that with the engine running, no other circuits should be operating except pins 9 and 10. NOTE: On modern cars, especially ones fitted with factory towing electrics, the vehicles Electronic Control Unit (ECU) might delay the turning on of the fridge circuit until it detects that enough charge has been put back into the vehicle battery after starting the engine. If you first test Pin 10 and don’t get a voltage reading, wait a few minutes with the engine idling and re-test. OK… turn the engine off and get some fresh air! That’s main two caravan supply feed’s checked. Now we need to check the neutral (earth) return path for each of the circuits. The three low voltage (12 volt) circuits are “road lights’, “fridge” and “leisure battery charging”. Within the caravan these three circuits are separate, including the neutral (earth) return path, the only time these three neutrals (earths) come together is at an earth point in the vehicle. So with the engine off, set your multimeter to read “Resistance” or “Ohms”. To check it is working, touch the two test leads of the multi-meter together, you should get a reading of 00.00 Ohms. With your multimeter negative test lead connected to the earth point on the car, test each of the three earth connection in the socket… (below). What we are looking for here is the lowest reading. In our example we have a reading of 0.11 Ohms. It is possible to get a reading of 0, but it is more likely to be just above. If it reads 0.5 or upwards, it is probably a bad earth connection. Check your meter’s connection in the car and re check. If the reading is still high, you need to find the earth terminal in the vehicle for the cable that you are testing and give it a clean. It might mean undoing a nut and using some fine emery cloth to remove any dirt from each terminal and possibly rust around the base of the terminal post. With the test above completed, we are now confident we have good earth connections and the leisure battery charging circuit and fridge circuit are operating correctly. The next test is for the road light connections. For this it is really helpful to have an assistant to turn on and off all the lights when required. SAFETY: make sure they understand that you are close to the rear of the vehicle, as this test requires the engine to be running. Now we check our ‘reference’ voltage again. Remember to reset your multimeter to read Volts DC. In the example below we have 13.75 volts again. Now we check each connection in turn. 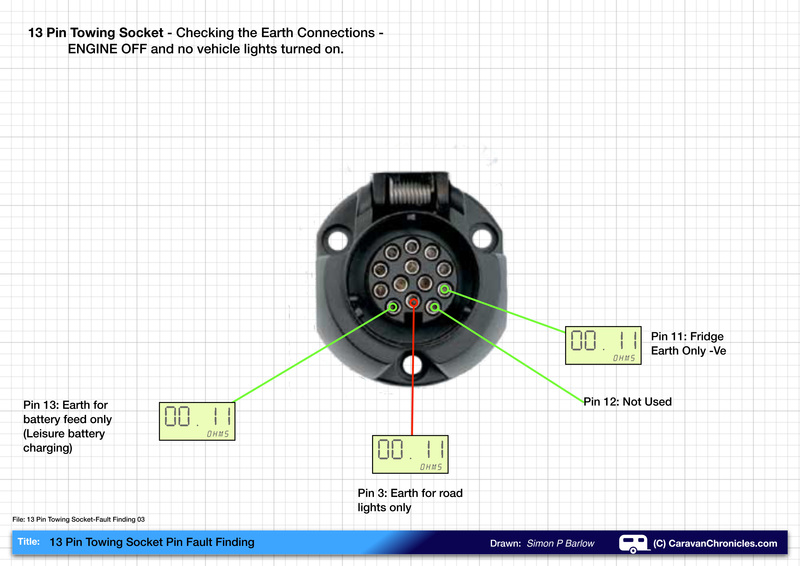 Make sure your meters negative (black) test lead is connected to your earth point on the vehicle. Working logically, start with pin one. There should be no voltage present, now ask your assistant to put the left indicator on. As this is an intermittent voltage, you might not read the same as the battery ‘reference’ voltage as the meter might not be able to register the full changing voltage, so it might only rise to 8 or 10 volts before going back to 0 and repeating. As long as you get a constant on off reading it’s usually acceptable. Keep going round the pins, connect the meter and ask your assistant to turn on that circuit. Remember, the rear fog light will need the headlights on. When you get to check the reversing light, this MUST for Safety be done with the ENGINE OFF but the ignition turned on. DO NOT ATTEMPT TO CHECK THE REVERSING LIGHT CONNECTION WITH THE ENGINE RUNNING! – I don’t want you to get run over! Put the test lead of the meter into Pin 8 and ask your assistant to select reverse. You should be able to read the voltage. After the above tests have been completed, connect up the caravan. If any faults exist, its likely that a fault is with the caravan’s wiring. If you have a fault on your 13 pin socket, by now hopefully you will know exactly which circuit it is on. If it is the road lights, then the next step is to check the fuses within the vehicle. If a fault is found with the leisure battery charging or fridge circuits, then more investigation is required. Checking the fuses in the vehicle for these is a starting point, but it may involve tracing the wiring back to find the relays that control these circuits and I would recommend you consult a qualified professional. Although on most of the drawings I show Pin 12 as not being used, this is actually incorrect. Pin 12 is used for trailer detection on some vehicles. How it works varies from vehicle to vehicle and obviously not all vehicles use it. Generally it is connected to the vehicles ECU system. The 13 pin plug on the trailer has a link between Pin 12 and Pin 3 (road light earth) so when you plug-in the trailer or caravan, it ‘shorts’ pin 12 on the towing vehicles socket to earth and the vehicle’s ECU detects this and activates any Trailer Stability Program on the vehicle. The full ISO standard is ISO 1446 for 13 pin connections. Very well explained and very helpful for those who may not be quite so electrically minded, following the above guide makes the testing of the euro sockets output’s very simple for anyone to undertake themselves. Your input within caravan chronicles helping and advising others is well appreciated by all, it must take you hours sometimes to put together drawings and expanations on various subjects. 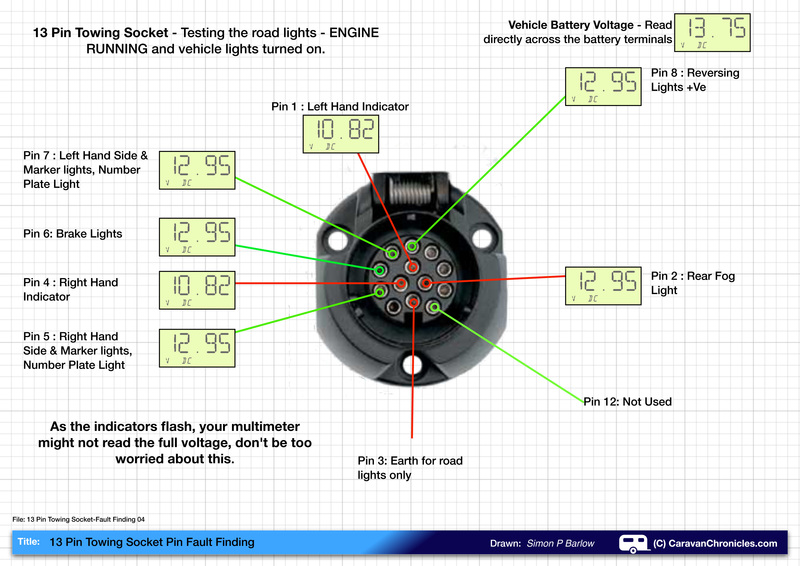 Just read your 13 pin socket fault finding – very good practical help – thanks . I have had problems with my 13pin socket , but you have made it simpler for me to understand with your clear text and drawings. Many many thanks . What a wonderfully clear explanation, and those charts are really works of art! Being one of those people having trouble (ie no voltage) with the ’10’ fridge pin, I was just wondering if this procedure also goes for can-bus equipped verhicles (i.e. my 2014 Skoda Yeti)? Or does there have to be a real ‘load’ on this pin to produce any voltage? It is worth checking that pin 10 is actually connected. Some vehicle manufacturers tow bar fitting kit does not include the leisure battery charing circuit or the fridge circuit. BMW & VW are two manufacturers that don’t include these two circuits. I don’t know if Skoda in the Netherlands include these two circuits. If the circuits are installed, then there should be a relay inside the vehicle that turns on the fridge supply only when the engine is running. This relay is either controlled by the alternator ignition light or the vehicle ECU. I tested ‘Number 10′ once more following your procedure and found no voltage, not even after a few minutes’ running, and not even at higher revs, and not even under load (i.e. the fridge). •	At least in the Netherlands, Skodas equipped with a tow bar (should) have pin 10 connected. •	This connection exists as soon as ignition is switched on, so the engine does not have to be running, and the can-bus system does not interfere. The right indicator on my caravan (2010 Swift Freestyle) is not working and in tracing the fault I’ve checked the 13 pin plug on the car (2010 Hyundai Santa Fe) as your guide sets out. Everything is OK with the exception that both the right and left indicators are showing 7.5V with the engine off. Would this every be normal given the make of car? Some vehicles put a small voltage on the pins and use this as part of the bulb failure detection system. This is what you might be reading. The voltage is usually around 7 volts and is current limited so the bulbs don’t actually glow. This can cause issues if the caravan is fitted with LED road lights. 17mV on pin 9 and 10 with the engine off – normal mode. 17mV on pin 9 and 10 with the engine off – economy mode. 17mV on pin 9 and 10 with the engine running. Plug the van ( Swift Sprite Alpine 4 ) in and hey presto everything works fine, Sargent power control system shows vehicle connected, start engine battery charges ( 13.75V van battery ) fridge operates no problem so pins 9 and 10 must come alive somehow. Pin 12 on the car socket has no contacts but all others 9 feeds and 3 earths are there. I made this discovery after making up a 4 core 2.5mm2 extension lead to charge the van battery up in emergencies when on sites without EHU; nothing worked so I assume that the “Trailer socket management system” must be triggered to live up pins 9 and 10 when it senses the trailer lights are connected and not before. I would very much appreciate your opinion? Your vehicle has trailer detection, most probably activated when the vehicle senses road lights connected to the trailer socket. Once a trailer has been detected the vehicle’s computer will turn on the required fridge and leisure battery charging circuits and also (I think Citroen has it) it will change the electronic stability program and in some vehicle models will cause the ABS system to react differently and the automatic gearbox (if fitted) to change its shift parameters. If you want your lead to work, it will just mean adding a 10 watt bulb across the appropriate road light circuit to ‘fool’ the car into thinking there is a trailer attached. Simon – Many thanks for your response and confirming my suspicions, plus what a great blog. My gut feeling tells me its the brake light circuit that acts as the trigger as the brake pedal has to be pressed to start the engine. Having said that, I believe pin 9 switches on up after the trailer plug is inserted even without starting the engine. ( I will check this in more detail ). I have checked the pins 1 to 8 voltages and all read 8mV apart from pin 3 – earth 0.0V ( to be expected ) and pin 6 – brake lights; only 1mV. All very small voltages. You mention a 10wattt lamp, would a 14.4 Ohm resistor do the trick? A resistor would do the trick, I would go for a higher resistance though. A cold filament lamp has a lower resistance than a hot one. A number of other manufacturers use the brake light circuit as a check, so that’s the one I’d opt for first to try. Hope you can help, i have fitted a vehicle specific westfalia wiring kit (13 PIN) to a 2015 Kia Sportage. I appears to correctly ‘charge’ the caravan leisure battery when the engine is running – which is great. However, none of the lights work on the back of the caravan (Brake, Side, Indicators etc) i have of course checked with someone else car, and the caravan lights are working. Following the guide, i get 0.4V out of the PINs that control the indicators, and it does flash, on and off between 0.4 and 0 – which seems to be correct, apart from the fact the voltage isn’t high enough…. Westfalia technical support said, i shouldn’t test this way as the socket needs a ‘load’ attached to work. That doesn’t sound right to me but, im no expert. A lot of vehicles now use a can bus system for the lights and you need to put a load across the terminal. The usual way is to put a 10 watt or 25 watt bulb between the pin and earth. The canbus system uses this load to detect bulb failure and as a trailer detect on some vehicles. With the bulb in place, you then take a voltage measurement as normal. Thank you so much for all the detailed information. This was exactly what I needed to confirm a faulty towbar electronics. A logical write up, I’ll be using this guide when testing my installation, thanks. Nearly everything I need to wire my socket up has arrived, but I was wondering if it’s acceptable to wire pins 5 and 7 together, as it looks like my tail lights are on a single fuse and the harness spurs off from one side to the other? Doesn’t seem any need to run each wire to the left (7) and right (5) tail lights. Quite simply, no. Its never a good idea to link 5 and 7 together. Combining them together could cause issues with loading on the vehicles light circuits and the increased voltage drop on nominally sized vehicle wiring could cause issues with the caravan road lights being dimmer than designed especially when indicators are being used (tail lights flickering in time with the indicators) It also can cause problems when you get a fault. If 5 and 7 are joined and the circuit supplying them had a fault, you will lose all tail lights, if they are supplied separately, and you lose one circuit, at least only one side of your trailer lights will go off. Thanks for the clarification, I’ll be sure to separately connect the respective pins to their corresponding taillights wires. Any good quality 13 pin plug will be fine. There are versions available that have a cable gland for the two (black & grey) cables used with a 7S & 7N conversion that save on replacing these two cables on the caravan with one 13 core cable. Yes, if you look into the cable gland on the plug, its like a figure of eight so both cables can enter rather than just one hole. The plug is exactly that same, its just the gland that is different. They are a bit fiddly to do if you haven’t changed one before, patience is the key. Thank you Simon I will buy one and try it regards Pete. The voltage used for bulb detection failure varies between vehicle manufacturers, some use a different system altogether. If these rise to 10.5 volts when the side lights are turned on I would tend to suspect there is a wiring fault. My first thought would be a faulty earth connection as the sidelights might be trying to find an earth path back through the indicators. When you operate the brakes, the brake light fuse blows, this makes me think that the bike rack earth and brake light (pins 3 and 6 respectively) could be the wrong way round. One thing that has totally baffled me is For some reason there is a Blue/Black cable for the 13pin socket. All other cable colours correspond to the standard except this one and I can’t find anything written anywhere about this. Do you have any ideas? I can’t find anything about this anywhere! You talked about making sure your earthing your multi meter on the vehicle which makes sense. How comes you can’t test by using pin 3 when testing the road lights or pin 13 when testing pin 9 etc. Also while I was wiring up the pins I could see 3 other small flat pins on the inside of 13pin housing just to the side of the 13pin holes like it takes a plug of some kind. I’ve not seen anything mentioned about this anywhere and just wondering what its for. The additional cable is probably the one used to let the vehicle know there is a trailer attached. Some 13 pin sockets have a microswitch (the pins you might be seeing) that detect when a plug is inserted to let the vehicle electronics know a trailer is present. With regard to using the vehicle earth as a testing point. Using a known earth point as a reference ensures you are actually testing each circuit. By using pin 3 you are assuming that it is actually earthed. Bit of a bummer if you get through trying to sets some of the circuits that seem to be faulty only to find out the earth is not connected! Many thanks for the reply. Makes total sense for the earthing but wanted to make sure!. That pointed me in the right direction. I finally figured out that the microswitch was for parking sensors (if you have them and used took pins 9 and 10 for some reason. Possibly kit specific. Also my socket had a pin 2a which that Blue/Black cable went in to and it was to do with the Fog cut out ability. Just in case anyone else is trying to figure out something similar. Thanks again for the post and will be keeping an eye on your site in future. On my 2009 Ford Transit pins 1 and 4 are constantly getting 3volts when the indicators are turned off, is that because of bulb failure detection? The trailer has LED bulbs so the turn indicators are always on because of these 3 volts. A simple resistor pack can do the trick or there’s more electronics needed? Can this be a relay fault? A simple resistor pack will do the job. All you have to do is fool the bulb failure sense circuit into thinking that there is a filament bulb fitted in the trailer. You can buy “CANBUS compliment led bulbs that have a resistance built in. If all the other road lights are working OK, then the road light earth should be OK, in which case you need to check Pin 1 and Pin 4 on the vehicle to make sure you are getting voltage when the indicators are on. I’ll assume you have checked the bulbs…. next test Pin 1 and 4 continuity to pin 3 (the road light earth) on the plug to test each indicator circuit. I have a 7pin trailer with road lights only. It is supplied from a crossed over 13 pin socket on a C-Class Mercedes. None of the trailer lights work. Fuses are ok, Bulbs are ok.
Voltages do not change with car lights functioning. Ground resistance of pins 3 & 13 is 0.4Ohms but the earth terminals are all very shiny and new looking. I presume the car detects current flow between pin 5/7 & 9 to determine if a trailer is connected and then delivers 12v when necessary. Therefore if my reasoning is correct if I correct a bulb across pin 5 & 9 I should be able to measure voltage on pin 6 when the brake lights are activated? If this does not work then probably there is something wrong with the widgets in the car? My head is now melted. Pin 5 and 7 are the left and right hand tail and marker light circuits and the voltage you are measuring is the trailer detect voltage. You are correct , if you connect a bulb between pin 5 (or7) and pin 3 (road light earth) the vehicle will recognise that a trailer is attached. The voltage tests for all road lights must be referenced to pin 3, road light earth. In your comment you mentioned connecting a bulb across 5 & 9. 5 is the right hand side marker and number plate lights and pin 9 is the +ve direct feed from the battery (leisure battery charging circuit). You need to connect the bulb between 5 and 3. Thanks for this great info.I have just had my towbar electrics updated to 13 pin from 7 pin on my xtrail.I connect to caravan and nothing happens till i turn ignition,then ATC lights green and everything works ok.When i turn off ignition.ATC still green and fridge is still supplied.Also car built in sat nav and radio still on and car central locking wont work.When i unplug the caravan car radio and sat nav go off and central locking works.Doing your test I find when ignition is off all pin holes are dead.With engine on 9 and 10 are live.Any help appreciated Alan. I did reply to your email this morning. 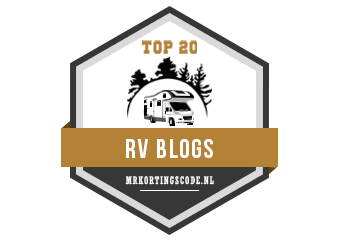 I am confident the caravan is back feeding the vehicle and this would be down to the fridge circuit and leisure battery charging circuit being either reversed or connected together when the caravan is plugged in. Hi Simon,I have had a friend round and I plugged my van into his car and everything worked as it should .So all probs must be caused by the new electrics.Tommorow I can go back to the towbar fitters and tell them that the faults are in the new wiring.Thanks very much for you help and I will let you know the out come. Get them to check for Pin 9 (+ve leisure battery feed) and Pin 10 (+ve fridge feed) reversal or interconnected (shorted) together. 99% confident its one or the other. I will do.I will be there at 8.00 tomorrow morning .When I told him my faults he couldn’t believe he had caused them.He said my car must be faulty.I explained the car was ok when not coupled to the van.It was nice today to try another car to prove the caravan side was right .Thanks Simon. Hi Simon,I took my car back to the towbar fitters today.He had it for an hour then rang me to say it was done and was ok on all his test eqiipment.He said the fault was caused by the relay not kicking in.Not sure but I took it home and plugged it into my caravan and everything works ok.At least it is sorted now,I wonder if he checked it with his tester when he finished the first time. Much thanks for your help,Alan. Great article Simon, really informative. I’ve just had a problem with my MoT test because the VOSA approved (Sealey) tester showed my 13 pin socket wasn’t working correctly. When I plugged it in to the caravan everything worked just as it should. The car is Toyota with a Toyota supplied wiring kit. I asked the tester to show me what he had found and sure enough the LED’s on the tester showed the fog light not working and the brakes lighting up both indicators. I think the clue is that the fog light on the car wasn’t cut off by plugging in the tester but it was with the van, so I suspect the car doesn’t recognise the tester as a trailer – probably because there are no lamp filaments to detect. Any ideas how to get around this without taking my caravan along to the MoT test every year? This is a fairly wide issue with the MOT test set’s used by some stations. There are three or four VOSA approved units offered by manufacturers and the older Sealy is one that is known to indicate failures. I believe that on a couple of MOT tester forums there is a lot of discussion about this issue and they have a list of what test units are OK. I believe that test units produced in 2018 have sorted the problems. I was told by an MOT inspector that if you remove the tow ball they cannot test the socket as the vehicle is not capable of towing. However I’ve been told all sorts of rubbish by MOT testers over the years and it seems to be all down to their personal interpretation of the rules.